The 2013 Corolla might be a bore…to drive, but it offers plenty of genuine value to people who just want something dependable and fuel efficient. The 2013 Toyota Corolla is an appliance, a vehicle constructed to and dynamically tuned to lowest common denominator requirements. However, excellent crash-test and reliability ratings, combined with good fuel economy ratings, a low price tag and a free maintenance program make the Corolla undeniably appealing to drivers seeking solid Point A to Point B transportation. Compact car buyers seeking dynamic involvement, or even to derive a little bit of pleasure during the daily commute, will want to shop elsewhere. Toyota sells its compact sedan, the 2013 Corolla, in L, LE and S trim levels, the latter designed to provide a sporty look if not driving feel. Our test car was the Corolla S trim, painted Barcelona Red and equipped with a touchscreen Display Audio system with navigation and Entune data services, and a Premium Package including a power sunroof and 17-inch aluminum wheels. The window sticker read $21,455. For 2013, Corolla L and LE trims get new chrome accents on the grille, the Corolla LE has chrome side moldings, and a touchscreen Display Audio system is standard for LE and Corolla S trims. Several new Premium Packages debut for the LE and S trims, adding varying levels of upgrades including larger aluminum wheels, a power sunroof, a power driver’s seat, automatic climate control, a navigation system and a 3-year subscription to Entune mobile application and data services. Special Edition versions of the LE and S models are also available, in limited quantities. The last time the Corolla was completely redesigned was for the 2009 model year, and today, the car is handsome in a bland, middle-of-the-road sort of way. The Corolla S adds much-needed visual interest in the form of a body kit and a rear spoiler, and the optional 17-inch aluminum wheels seen in the photos look terrific, but they promise an added dose of performance that the Corolla just can’t deliver. Inside, the Corolla appears dated and cheap. An all-new Corolla is expected for 2014 or 2015, previewed by the Toyota Corolla Furia concept car that debuted at the 2013 North American International Auto Show. It cannot arrive soon enough. Every 2013 Corolla is equipped with a 1.8-liter 4-cylinder engine generating 132 hp at 6,000 rpm and 128 lb-ft of torque at 4,400 rpm. A 5-speed manual gearbox is standard for the Corolla L, with a 4-speed automatic transmission optional. The automatic is standard for Corolla LE and S trims, delivering power to the car’s front wheels. The transmission includes uphill/downhill shift control and a manual shift mode. Fuel economy ratings are 27 mpg city/34 highway with the manual transmission, while the automatic is rated at 26/34. We averaged 31 mpg during a week of driving, with plenty of miles covered on the highway. 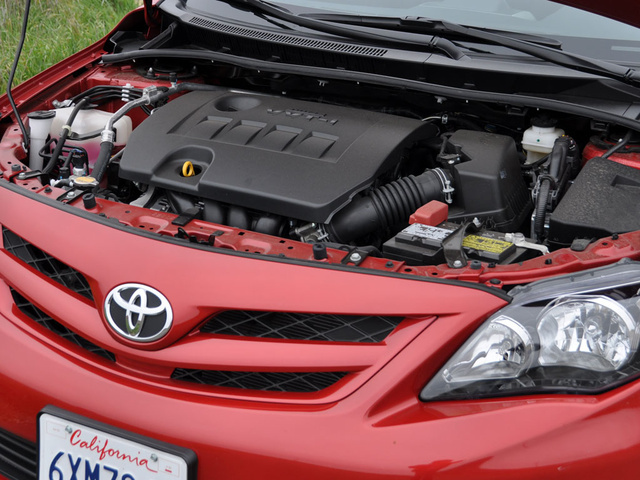 The Corolla’s engine burns regular unleaded gas. The Corolla isn’t underpowered, accelerating to 60 mph in about 8.5 seconds, but the 4-speed automatic transmission does the car no favors. When accelerating from a stop, it takes awhile for engine revs to climb to where horsepower and torque are made in decent quantities. When climbing elevation, the uphill shift control does its best to maintain the car’s speed, but the Corolla labors. On the highway, the engine has no trouble maintaining, and exceeding, posted speed limits, but there is little joy in doing so. Dynamic sophistication is not a Corolla strong suit, in part due to Toyota’s election to employ simple and cheap engineering solutions rather than more expensive and complex but ultimately more satisfying components. For example, Toyota installs front disc, rear drum brakes in the Corolla, an old-school design that produces brake pedal feel that lacks refinement, communication and progression. As a result, the pedal frequently feels numb and proves difficult to modulate smoothly. Suspension is comprised of industry-standard MacPherson struts in front combined with a simple, unsophisticated torsion beam axle in back. Many competitors offer an independent rear suspension setup, which offers improved ride and handling qualities. By contrast, the Corolla frequently exhibits a jittery ride. The Corolla’s steering is electrically assisted, and Toyota insists it is designed to vary effort levels based on vehicle speed and engine revs. In our experience, that means it alternates between heavy, leaden lifelessness and the light, disconnected feel of a video-game steering wheel. Occasionally, the driver senses subtle changes in vehicle course through the seat instead of the steering wheel, hands oblivious to the effects of road crowns and grooves that may be tugging the wheels this way and that. Handling limits are low, the stability control system kicking in the moment a driver attempts to toss the Corolla into a turn with any degree of gusto. This car won’t go fast through a set of curves, because it can’t. At the speeds allowed by the stability control system, the Corolla doesn’t lean excessively, and the tires don’t howl in discontent. The Corolla’s control layout is simple, mainly because there are so few features. The power mirror controls are hidden behind the steering wheel, but otherwise everything is easy to see and use, with the exception of the new touchscreen Display Audio system. Interior materials are unimpressive, especially the fuzzy headliner, which matched up poorly with plastic roof pillar covers in our test car. Switchgear is sourced from the Toyota parts bin and generally offers refinement in terms of appearance and operation. The Corolla is equipped with several storage cubbies and includes two gloveboxes. 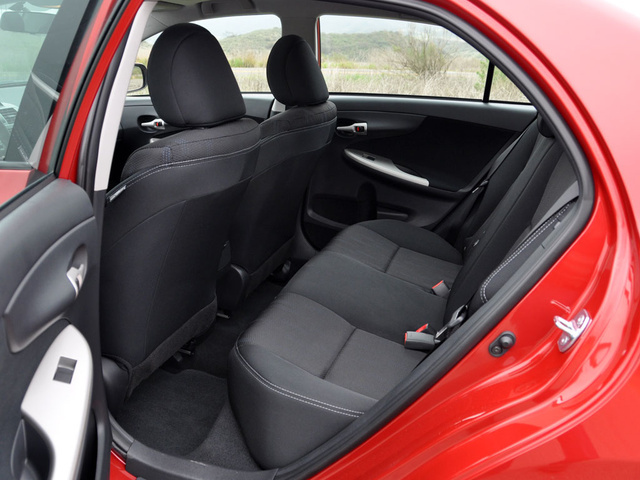 Seat fabrics look good and feel durable, and the seats themselves are comfortable, front and rear. It’s the way they’re installed in this car that is the problem. Anyone wearing a 32-inch inseam or greater is going to be uncomfortable in the driver’s seat due to tight leg space and is likely to find it difficult to fold his or her legs into and out of the Corolla. Additional seat track travel for the driver’s chair is necessary. Rear seat legroom is tight, but occupants sit high with a good view out, and the front seatbacks are soft and padded. Trunk space measures 12.3 cubic feet, about average for a compact car. The space is usefully shaped and seems larger than its official measurement might suggest. Equipped with a 6.1-inch color touchscreen, the Corolla’s optional Display Audio system includes a CD player, a USB port, an iPod connection, an auxiliary audio input jack, and Bluetooth calling and music streaming. Unfortunately, many of the virtual buttons on the touchscreen are too small for people with larger fingers to easily use, and the display washes out easily in sunlight. Both of these characteristics lead to excessive driver distraction while attempting to operate the system. Choose the Corolla LE model, and you can option the car with a navigation system and a 3-year subscription to Toyota’s Entune mobile services. With Entune, Corolla LE owners can run Pandora and I Heart Radio right from the in-dash touchscreen display; receive real-time traffic, weather and news information; search the Internet using a Bing search engine; and more. Every 2013 Corolla is equipped with what Toyota calls its Star Safety System: 6 airbags, antilock brakes with brake assist, traction and stability control system, and a Smart Stop system that makes it impossible for the car to accelerate with the brake pedal pressed. There are no safety-related options for the Corolla. In National Highway Traffic Safety Administration crash tests, the 2013 Corolla receives an overall rating of 4 stars, but in the side-impact pole test, the car gets a 3-star rating. The Insurance Institute for Highway Safety calls the 2013 Corolla a Top Safety Pick, but has not yet assessed this Toyota in its new small overlap frontal-impact test. Rated as a Top Safety Pick and Recommended by Consumer Reports, the 2013 Toyota Corolla comes with 2 years or 25,000 miles of free scheduled maintenance and roadside assistance. Plus, Toyota dealers are usually offering rebates, low lease payments, and other incentives to help keep Corollas moving off lots. The Corolla’s standard warranty, however, is relatively unimpressive, providing 3 years or 36,000 miles of coverage for the entire vehicle and a powertrain warranty of 5 years or 60,000 miles. Many competing models offer greater protection levels than this. Nevertheless, we averaged 31 mpg during a week driving the Corolla, and while many of those miles were covered on the highway, that performance beats the EPA estimate by a full 2 mpg. The 2013 Corolla might be a bore, if not quite a chore, to drive, but it offers plenty of genuine value to people who just want something dependable and fuel efficient for the daily commute. 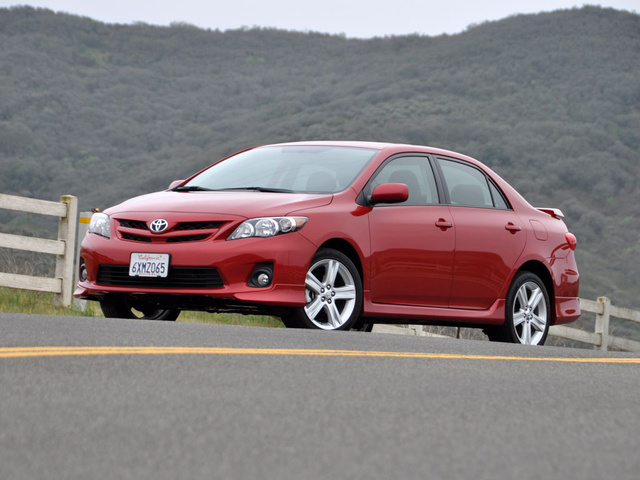 What's your take on the 2013 Toyota Corolla? marstob This car does extremely well on gas mileage but only made for city driving. Attempting to drive over hilly or mountainous roads it does not handle well. The car steers one way and the back end slews around. When windy, in particular - difficultly in maintaining proper control unless at a slower speed. I am not a happy camper having purchased it new. The dealer had it taken for a test drive - but on a straight road - and no problem with the alignment. But, the car wasn't taken for a drive on a road with curves. Not a happy camper and will not keep it. 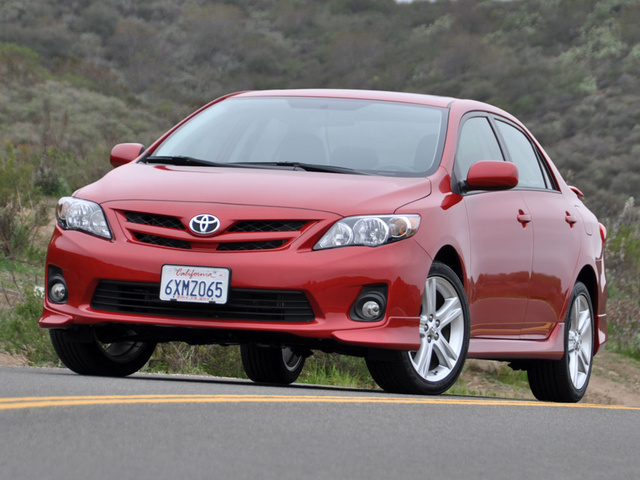 Users ranked 2013 Toyota Corolla against other cars which they drove/owned. Each ranking was based on 9 categories. Here is the summary of top rankings. 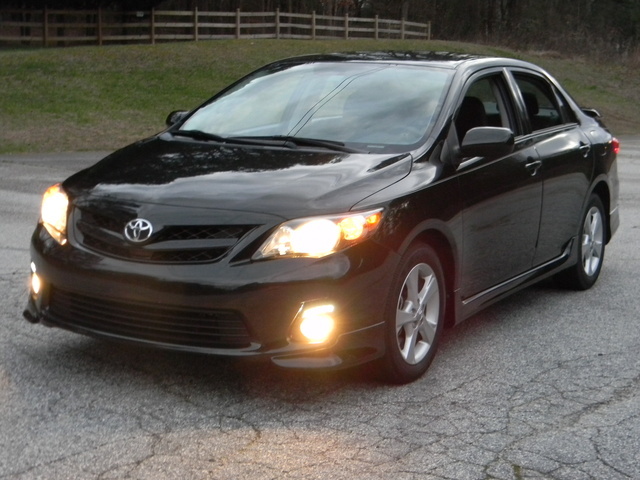 Have you driven a 2013 Toyota Corolla?